All tours around the farm are available in English (guided tours, unguided visits and Safaris). The Baudets du Poitou will share all their secrets with you! Here, you are welcomed into the world of the Baudets, where you can approach and stroke the donkeys (and foals, depending on the season) and where our guide will enlighten you about the protective measures put into place to ensure the conservation of this breed. Times of guided tours: 11.00 a.m., 2.30 p.m. and 4.00 p.m.
Start times may vary according to bookings, so please contact us in advance to confirm the time and day of your intended visit. Take your time discovering the different équine breeds that originate in the Poitou area as well as what goes on behind the scenes at the Nature Centre. Visit the museum and stroll around the outdoor pathways. There is a fun learning quiz available at the reception for children. Cost: full price 3 €, concessions 2 €, free for children under 6. Open every day from April to September: from10 a.m. – 12 a.m. and from 2 p.m. – 6 p.m.
By reservation only during off season. An alternative way to explore the Nature Centre : by carriage ! Available by reservation only. Cost: adults 10 €, 8 € for children aged 4-18, free for children under 4. Please be aware that our canine friends are not allowed on the tours or other activities (except guide-dogs). All activities are available in English if required. Booking is required in advance. An unusual ride at the leisurely pace of a Poitou draught horse or mule. You are given the opportunity to explore the farm and its surroundings from a different perspective and at a different tempo, in tune with nature and in time with the horse. 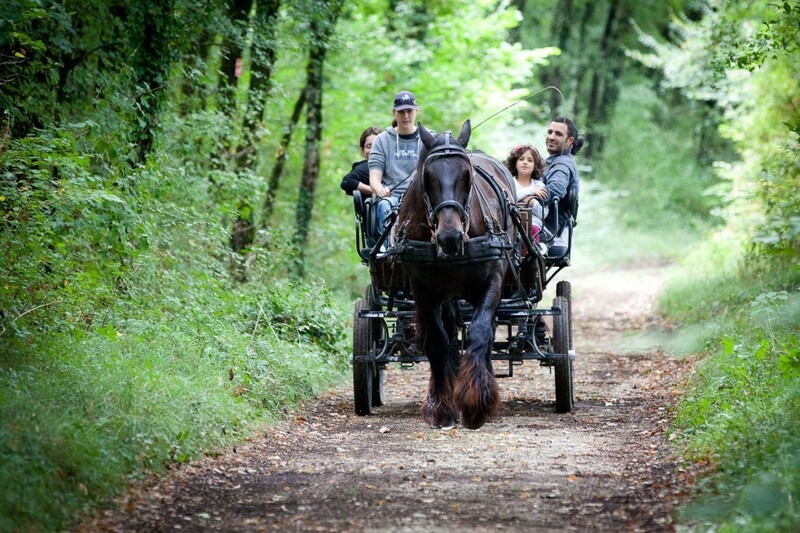 An original way to travel in harmony with nature and an uncommon companion: a Baudet du Poitou donkey! He will carry your packed lunch (not provided) whilst you peruse the footpaths on an easily accessible round trip of 3 kilometres, accompanied by a guide. By reservation, only during July and August. Suitable for children aged 4 and upwards. Two fun tracks to choose from to really get the feel of being on the back of a Baudet donkey lead by parents. No open footwear for children or adults. Please be aware that our canine friends are not allowed on the tours or leisure activities (with the exception of guide-dogs). Spend an unforgettable day in Dampierre-sur-Boutonne ! Spend the morning getting to know the oldest breed of donkeys in France on a guided tour of the Asinerie du Baudet du Poitou Nature Centre. Then enjoy a gourmet lunch composed of local products and served aboard a carriage which takes you to the enchanting village of Dampierre-sur-Boutonne. The afternoon is spent exploring a jewel of the Renaissance era with a guided tour of the Château de Dampierre-sur-Boutonne and an unguided stroll around the grounds. Complete the trip with a ride back to the Nature Centre by carriage! From 11 a.m. to 5 p.m. Only available on reservation at least one week before the activity . Please note that places are limited. Cost for children aged 4 – 12: 25 €. This activity is not recommended for very young children. The guided tours of the Nature Centre and the Château can be provided with an English-speaking guide.